The new Ford Focus Electric is distinguishable from the standard Focus in a few ways: Naturally, it’s cheaper to run, but it’s also more expensive to buy. And while it’s got more standard kit, it doesn’t handle as well. Lots of pro and cons for buyers to assess, then. However, what will attract buyers to this car more than anything else is the fact that it’s an all-electric, super green version of one of the UK’s most popular Hatchback’s. But is it worth making the switch to electric power? The new Ford Focus Electric is powered by an electric motor that develops 143bhp, which is a reasonable amount of power. It covers the 0-62 dash in 11.0 seconds flat, and because it delivers all its power instantly, it pulls away from roundabouts, junctions and traffic without hesitation. It also feels faster than its 0-62 time suggests. Top speed, meanwhile, is 86mph, which is a bit underwhelming. There are numerous caveats. For one thing, the suspension setup is much harsher than the petrol and diesel-powered Focus. 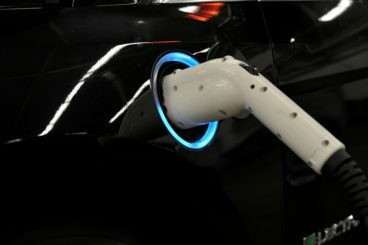 This is the case with all electric cars, as automakers have to find a way of ensuring the extra weight of the batteries doesn’t ruin handling too much. Unfortunately, it hasn’t worked too well here, and you really feel the car’s extra weight as you tackle corners. As a result, it’s disappointing that the Focus Electric isn’t as entertaining as its standard sibling. It also doesn’t do a good job of smoothing out lumps and bumps. A system that captures what would otherwise be wasted energy when you brake so as to maximise range also doesn’t work. Well, it does work but it’s not very enjoyable. It makes the brake action feel grabby and abrupt, especially in the towns and cities. Overall, performance and handling aren’t on par with the regular Ford Focus. Will buyers mind? There are certainly more performative and entertaining electric cars around at this price range. Any remaining positives? It’s quiet and offers a relaxed driving experience. The Ford’s cabin is well-appointed as usual, but buyers might be a bit miffed that there’s barely anything in here that distinguishes it from the standard model. In fact, the only feature that the EV version gets which the standard Focus doesn’t is a charging port flap. It’s a neat looking piece of tech that lets you know how much charge you’ve got left. Other than that, the radiator grille opening and everything else is also found in the regular model. That said, the EV’s instrument cluster is different, and displays info such as range, battery charge and energy usage. But it’s hardly anything special, and the problem is that this extra, necessary tech is what has helped to drive the car’s price up. Comfort-wise, the Focus Electric does okay. The firm suspension setup doesn’t help matters, but the part-leather seats are comfortable, while the driver’s seat and steering wheel offer enough adjustability for the driver to find the right position. 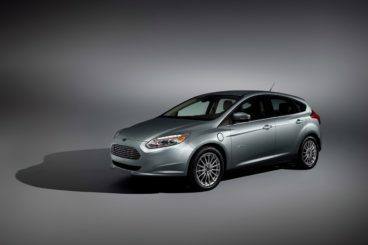 Is the Ford Focus Electric practical? It isn’t purpose-built, which means Ford has had to shrink the boot to make room for the large batteries. Instead of sharing the same 316-litre boot with the standard model, this EV variant has a 237-litre boot. That won’t go down too well with some buyers, and the overall packaging of the car is decent at best. Rear knee and foot space aren’t the best, but five adults should be okay on shorter trips while its dimensions are par for the course in this class. Standard kit is good and includes a bespoke instrument cluster, an up-to-date version of the brand’s SYNC 3 infotainment system, part-leather seats, cruise control, sat-nav and a digital radio. Buyers can also choose from five different exterior colours, while rear parking sensors (£225) and premium metallic paint finish (£525) are the only optional extras. In terms of how safe it is, the standard model was awarded all five stars when it was put through its crash test paces by Euro NCAP. Its safety kit includes a system that lets you know if you have a puncture, a driver tiredness monitor, lane departure warning, and lots of airbags. Prices for the new car start out from £31,680. For more information on our leasing deals, you can check out our page here. In terms of its running costs, Ford claims the car has a range of 140 miles, with an overnight charge costing just £2. In other words, peanuts. The Focus Electric is also exempt from the London Congestion Charge and road tax, and it has a BiK rating of 9%. However, its price is high, while it sits in insurance group 20. Moreover, depreciation is expected to be poor. Imagine if electric cars were great for the environment but ultimately a bit rubbish? Fortunately, the Focus is green and, because it’s based on the popular Focus hatchback, you know it’s going to be a good car. Its 140-mile range isn’t the best around but it’s decent. It’s not flashy and there isn’t much to distinguish it from the standard model – but that’s hardly a bad thing. Due to its extra weight, this electric variant isn’t as sharp as its petrol or diesel powered siblings. The standard model is much cheaper to buy. Let’s see how the car fares against its rivals in the comparison section of our 2018 Ford Focus Electric review. The Nissan Leaf is one of the best-selling electric cars on the market. Now in its second generation, it should no longer be seen as a quirky outsider. Instead, this is a very viable Hatchback that should act as a proper rival to conventional cars. On the road, the Leaf’s electric motor delivers 148bhp (which is 40bhp more than last time), immediate torque, and covers the 0-62 sprint in 7.9 seconds. That means its 0-62 time is up by over 3.0 seconds, making it one of the fastest compact EV’s available. Despite that extra surge of power and pace, the Leaf is still just as quiet as last time – but it isn’t any sportier. Nissan has added a brand new piece of advanced tech called e-Pedal, which lets you cruise using just the accelerator pedal. The brakes come into use only when you need to brake suddenly. The e-Pedal will take a bit of time getting used to, but its benefits include improved driving range and reduced driver fatigue. Overall, the Leaf is easy to drive and suits the towns and cities well, where its light steering makes perfect sense. Running costs? Super low. 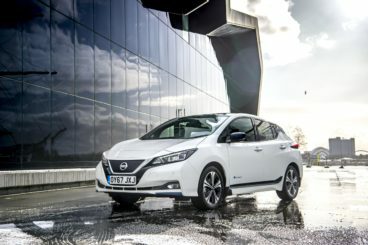 The Leaf has a claimed driving range of 235 miles, and Nissan reckon it costs buyers 83% less to run than a traditional diesel or petrol Hatchback. The car is also exempt from road tax and the London Congestion Charge. Inside, Nissan has swapped the Leaf’s previously quirky light cream interior for a black one. As a result, its interior is now a lot more conventional, which some buyers will appreciate and some won’t. There’s no arguing with the overall quality – the cabin is well built and comfort is good. However, low rent plastics and bland switches don’t look so good and mar the overall effect. Nissan claims the Leaf is 30% quieter than its rivals, and insulation is fine. Is the Nissan Leaf practical? It’s bigger than last time, which means there’s more room for families. In fact, it boasts bigger dimensions than the Ford Focus. Four adults should be able to get comfortable enough, even on longer trips, but rear knee room is slightly compromised by the fact that the rear seated passengers are sat higher up. There could – and should – be more storage spaces, but access is easy and the boot measures a very impressive 435-litres. This makes it one of the biggest boots in this sector, although a pair of charging cables take up some of that room (although not much of it). The new Volkswagen e-Golf is one of the best-built cars around. It’s super affordable to run and comes complete with the upmarket image of the standard Golf. It’s always a worry when you switch to the electric version of a popular, entertaining car that it won’t drive as well. Fear not, because the e-Golf looks and drives a lot like the regular model. VW has had to stiffen its suspension setup to cope with the extra weight, but other than that, it’s as you were. This means fluid handling, plenty of grip and a good turn of pace. It’s not 100% as sharp as the original model, but it isn’t far off. The e-Golf benefits from a brand new, higher capacity battery that’s joined by a 134bhp electric motor. It has a 0-62 time of 9.6 seconds, which is almost a whole second faster than last time, and it feels quicker still. There are three driving modes to choose from, with Eco Plus helping you maximise range, while the regenerative braking system further maximises range. We kid – they’re amazing. 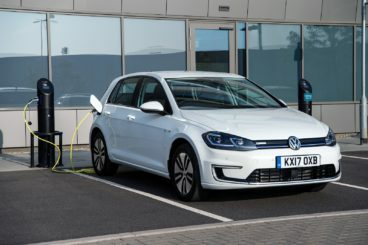 Volkswagen claims the e-Golf can keep going for up to 186 miles on a single charge, and while we think that number is a tad optimistic, it probably isn’t too far wrong. Buyers can charge 80% of the battery in 45 minutes if you use a public charger, and the car has a BiK rating of 9% – the lowest possible. Inside, the e-Golf is just as well-built as the standard Golf, but has the benefit of being even quieter. This improves comfort and relaxation, but special tyres, wheels and a stiffer suspension setup offset things slightly and the ride is jerky over poorer surfaces. All models come with a 12.3” Active Info Display, contrasting blue stitching – but there isn’t much to distinguish it from the regular model. Not that that’s necessarily a bad thing. Is the Volkswagen e-Golf practical? Its boot isn’t as big as the standard models, and measures 341-litres instead of 380. It’s easy enough to fold the rear seats, and doing so increases load capacity to 1,231-litres. Other than that – and the fact that it isn’t really a tow car – the e-Golf is much the same as the regular Golf on the practicality front. Adults are well-accommodated upfront and in the rear, felt-lined door bins are a lovely, sound-deadening touch, and storage solutions are good. When weighing up a car like this, you really do need to examine your priorities. What do you want the most? Low running costs and zero emissions? Good range? Or sharp handling and practicality? The Focus EV delivers the customary low running costs we associate with electric cars, and it’s certainly green. But it’s more expensive than the standard model and isn’t as sharp or as practical. The Ford Focus Electric is very much hit and miss.